The black rhino is smaller than the white rhino and can also be distinguished by its pointed upper lip. Adults are mainly solitary, although mothers and daughters may stay together for long periods of time. They were once found throughout most of sub-Saharan Africa but exist in small populations from Kenya down to South Africa. The Black rhino population has declined by an estimated 97% since 1960 with numbers as low as 2,410 in 1995, mainly as a result of poaching. Since then, numbers have been steadily increasing but the species is still at risk. There are now three remaining subspecies of black rhino occupying different areas of eastern and southern Africa. They are found in a wide range of habitats from desert areas in Namibia to wetter forested areas. The highest densities of rhinos are found in savannahs and bushveld areas. Black rhinos are browsers and eat mainly acacia’s and other woody species, using their prehensile upper lip to pluck leaves from the branches. 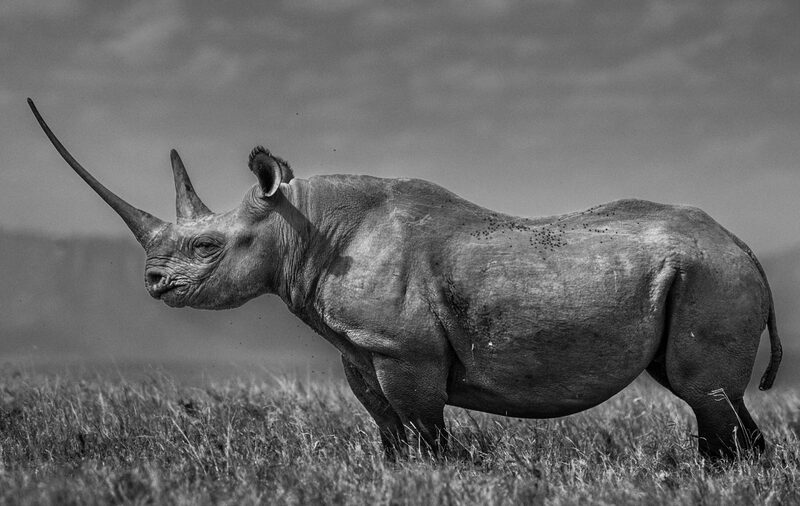 The main threat to the black rhino is poaching for the international rhino horn trade. In recent years, there has been an increase in the black-market price for rhino horn leading to an increase in poaching. Successes in black rhino conservation has seen numbers increasing, but the most recent poaching crisis has once again seen the black rhino pushed towards extinction. Tusk invests in monitoring and surveillance of important black rhino populations, protected them from poaching and maintaining populations at stable levels in many areas.